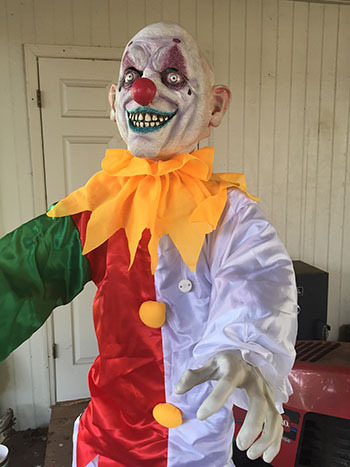 Every now and then you come across a prop online that is truly terrifying. 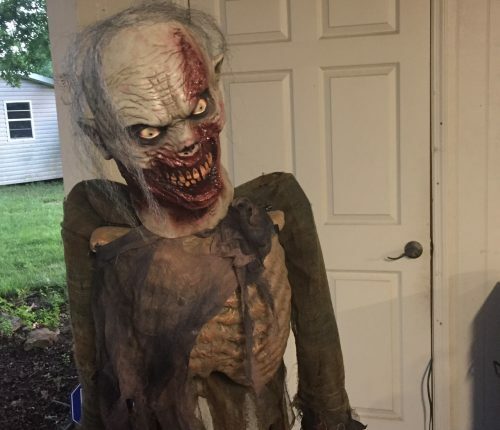 Last summer I came across the 6′ Man Eater Zombie Prop on eBay and I wondered how on earth this really scary prop could be available for $60. This is the image from the prop that I bought on eBay. It’s terrifying right? 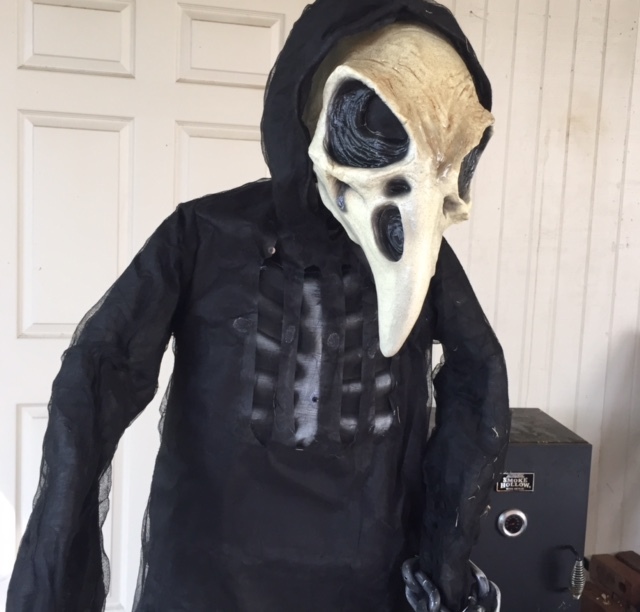 I just knew that this guy was going to be a hit at my Halloween party. Then he arrived and this is what I got. Is it just me or does the prop looking nothing like the picture I saw in the ad? His eyes were glowing orange and he looked a lot more menacing. I was really frustrated with my purchase and even contacted the seller about returning the item. 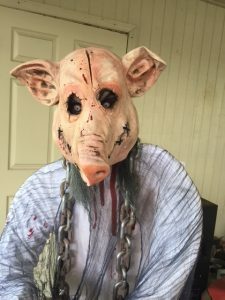 The next day I was looking online at some Halloween masks and I came across a pretty gruesome pig mask. Instead of sending the prop back I started thinking about keeping him and covering his goofy face with a mask. I thought that if I got a cool enough mask I could still have it where my guests at the party could still see his eyes early on in the afternoon. But once it go dark all you would see was the mask anyway. 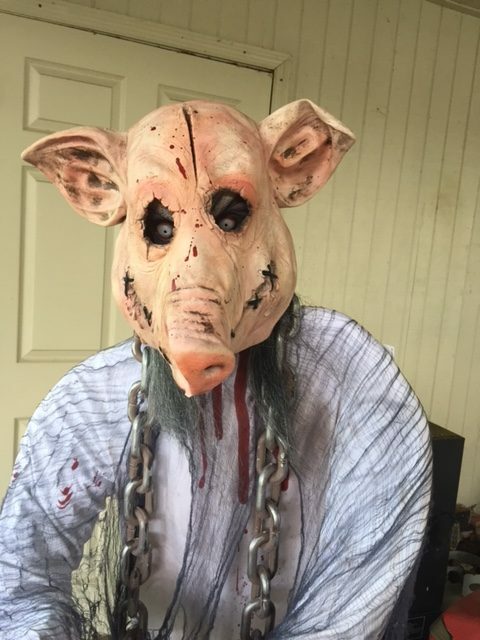 I bought a pig mask for $40. 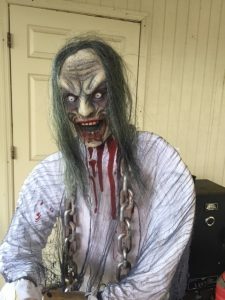 My wife had been watching American Horror Story and I figured a man in a tattered and bloody gown would be a great addition to the other props I had set up around my property. I put some bubble wrap around his arms to make him look a little more lifelike. I have an outdoor fridge under my carport and I set him up there to greet anyone who wanted to get a beer or Coke that night. Here’s how it ended up once I got done with him. Pretty creepy huh? Even though I got hoodwinked from someone on eBay I still made it work and used the frame of the prop and his clothing to make something a lot cooler without breaking the bank. It’s not the best prop in my collection but it’s worthy or putting out on Halloween now that I’ve upgraded him. I’ve done similar things with other props I’ve acquired over the years. 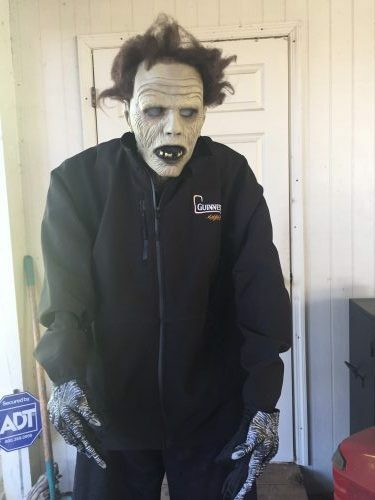 I picked up a silly skeleton vampire animatronic from CVS that I re-did by covering up his silly vampire vest with an extra large coat and covered his face with a cool zombie mask. The day after Halloween is the perfect time to pick up animated props no matter how bad they are. 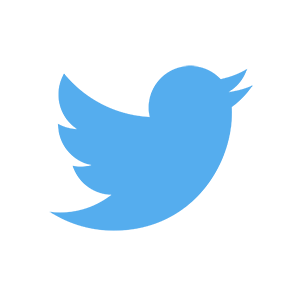 You really just need the frame and your imagination to make him into something really cool.